The Professional Forum is a research based magazine published three times a year, helping educators stay current. 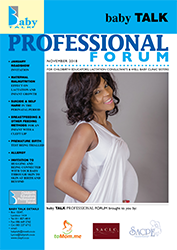 The Professional Forum is a magazine published three times a year and posted directly to over 1 500 Childbirth Educators throughout the country. The magazine typically contains the latest research in the Childbirth Education field from around the world. The Professional Forum affords companies an opportunity to communicate directly with Professionals. The magazine is sent to the childbirth educators, well baby clinic sisters and lactation consultants in private practice – they receive both the printed version as well as a digital version. an educational publication containing the latest research and updates in the Childbirth Education field. published 3 times a year, in March, July and November. distributed to over 1500 Childbirth Educators and Well Baby Clinic Sisters in private practice in South Africa, who reach over 60 000 expectant moms and dads a year. Download Rate Cards and Booking Forms to reserve your spot in the Professional Forum or contact us if you need a little more information in order to make your decision.